This month’s survey of almost forty retail-roasted samples from twenty distinguished Canadian roasters confirms both the depth and liveliness of the current Canadian specialty coffee scene. It also suggests that Canadian specialty coffee roasting has proceeded in an essentially parallel track to specialty roasting in the U.S., although it’s possible to speculate on some very small differences in overall taste and direction. Before reporting and speculating, however, the usual caveat: The nearly forty coffees we collected for this survey, however wide-ranging, do not compose a complete survey of the Canadian fine coffee scene. Two distinguished smaller roasting companies had their submissions held up by border regulations, and only one roaster submitted coffee from mainly French-speaking Quebec. But the coffees we did sample present an exciting and useful overview, and in general suggest that Canadian specialty roasting companies and their coffees, like those in the U.S., can be broken roughly into three categories. First, medium to large roasting companies with long histories, companies that produce coffees in the ongoing tradition of North American specialty coffee. These companies – represented in this month’s cupping by Van Houtte and Timothy’s in Eastern Canada and Canterbury Coffee in Western Canada – also tend to roast on an average a bit darker than roasters falling into the second category: Newer, smaller and currently trendier roasting companies that have built their businesses around offering very specifically identified lots of coffee (differentiated by farm, by processing method, etc.) at a light to medium roast. These companies typically also produce blends, but for this month’s cupping they almost universally chose to send us medium-roasted single-origin coffees. The third category is the dark roasters, companies that were established, often in the 1980’s through 1990’s, around the practice of dark-roasting all of their coffees. These companies also typically aimed to differentiate themselves by building their businesses exclusively around sustainable coffees, particularly organic- and Fair Trade-certified coffees, although today sustainably certified coffees turn up across the range of the specialty industry in both Canada and the U.S. Fourteen of the thirty-nine coffees we cupped for this review, or 36%, carried at least one sustainable certification. A possible fourth category may be the newest of all, companies that are essentially extensions of producers in growing countries. Both Doi Chaang and Las Chicas Del Café (both represented in these reviews) are Canadian-based companies that exclusively offer only coffees grown by their producing country partners (Doi Chaang by a large, entrepreneuring cooperative in Thailand; Las Chicas Del Café by a progressive Nicaragua farming family). Although differing in scale (Doi Chaang appears to be a considerably larger business than the apparently intimately family-owned Las Chicas) and doubtless in business arrangements, these two companies do offer an interesting model for producers, one that has considerably more potential than the model that involves producers attempting to roast their coffees in their home countries and ship them already roasted and packaged to the U.S. and Canada, a model fraught with technical difficulties. Roasted coffee is a notoriously delicate product and even well-packaged is liable to fading and staling during longer-term storage and shipment. Timothy’s World of Coffee and Van Houtte, two of Canada’s larger, long-established Canadian specialty roasters, are represented in this month’s reviews by appropriately traditional specialty coffee offerings. The Van Houtte’s 89-rated dark-roasted Sumatra reviewed here represents a coffee type that has become one of the staples of North American specialty coffee in the years since Alfred Peet introduced the style in his Vine Street store in 1966. The Van Houtte version displays the pleasingly rough, earthy, grapefruity pungency typical of the type and offers reassuring evidence that Canadian specialty continues to honor its roots and the preferences of Sumatra devotees by avoiding the all-too-common extremes of the type: limp simplicity on one hand or over-the-top earthy mildew on the other. Timothy’s Kenya AA (90) represents another favorite type pointing back to the classic days of specialty: It is utterly true to the tartly sweet, black-currant Kenya profile that we all have enjoyed for decades, brought to a roast level darker than favored by the trendier new roasters but nicely calculated to round but not mute the classic pungently dry Kenya fruit and supporting rich acidity. The third of the larger, long-established roasters represented in this month’s reviews, the fine West Coast roaster Canterbury Coffee, appears to be putting its more innovative side forward with the submission reviewed here. The 90-rated ReSIProcate Verità Espresso (reviewed this month as cupped rather than brewed as espresso) breaks the older-fashioned specialty mold in a couple of respects: first by its sustainable credentialing (certified organic and Fair Trade) referenced in the punning brand name (ReSIProcate), as well as by its suavely medium-dark-roast style, distinctly different from the slightly scorched, cedary intensity of traditional North American espressos like the Starbucks flagship blend and its many imitators. After having cupped a succession of pure, silky, coffee-fruit-and-flower-toned medium-roasted coffees submitted this month by newer Canadian roasting companies, I found it tempting to speculate that these Canadian roasters are roasting even lighter than their U.S. counterparts and choosing even purer, more delicate coffees to roast lighter. This suspicion is hard to confirm, however, since the majority of the smaller, trendier U.S. roasters have situated themselves on the light side as well. Nevertheless, it was striking how often when cupping this month’s Canadian submissions we encountered delicate, silky coffees expressing with great purity variations on the essential flavor of the coffee fruit itself: a fresh, pie-cherry tartness complicated by floral notes and enveloped in a natural sweetness that often reads as honey or molasses. We found this general sensory tendency expressed elegantly in the 49th Parallel Ethiopia Yirgacheffe (92), the Ethical Bean Exotic Medium Roast (a wet-processed Ethiopia, 91), the Detour Coffee Burundi (90), the Java Blend Kenya Igandene (90), the Equator Coffee Roasters Ethiopia Medium (90), the Phil & Sebastian Bolivia (89), and the Las Chicas del Café 1971 Nicaragua (89). These all were exceptional if varying expressions of the style, but for many coffee drinkers the full expression of coffee may require a very slightly darker roast to deepen and round flavor. Certainly that possibility occurred to us as we cupped our way through these pure (and purist) coffees. The coffee in this style that popped to 92, the 49th Parallel Yirgacheffe, was roasted to about the same degree as similar coffees from other roasters, but as with the Ethical Bean Ethiopia (91) the character of the green coffee may have essentially boosted the sensory impact a bit. Ethiopia wet-processed coffees tend to have more going on aromatically than most other origins, particularly in way of top notes, doubtless owing to the presence of local Ethiopian heirloom cultivars of Arabica rather than the more neutral-tasting cultivars that generally (though not always) dominate coffees from most other parts of the world. All of these pure, meadowy coffees were processed by the classic “wet” or “washed” method, meaning that the fruit skins and pulp were removed immediately after the coffee was picked and before drying, a procedure that emphasizes clear, transparent sensations and a sweetly tart fruit character. We also received three natural or dry-processed coffees (wherein the coffee is dried fruit and all): two lushly fruity-fermented Ethiopias and a Brazil. Most likely had we staged a similar cupping in the U.S. we might have gotten more of the big, fruity-fermented Ethiopias, as they represent a currently popular coffee type among the small-lot, medium-roasting crowd in the States. Perhaps – perhaps – the fact that we received only two suggests a mild preference among trend-setting Canadian roasters for purer washed coffees over strong-charactered but less predictable alternatives. Of the two natural-processed Ethiopias we received, the Social Coffee Sidama Ardi (90; not reviewed here) represented the cleaner, brandy-cherry-and-cocoa expression of the style. 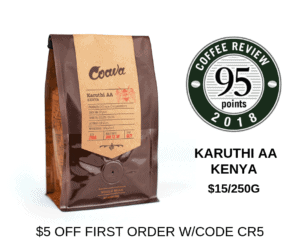 The other natural Ethiopia, also not reviewed here but rated 88, came from the same coop but displayed a heavier, more explicit ferment that was quite engaging when the cup was hot but turned slightly composty as it cooled. The most exciting of the alternatively processed coffees we sourced this month, the Social Coffee Panama Los Lajones honey coffee (topping the reviews at 93), could be seen as a successful compromise both in processing method and sensory profile. Honey refers to a processing method that situates half-way between dry processing and wet processing. In the honey process the skin is removed from the beans but they are dried with the fruit pulp still clinging to them. The process is a tricky one, since the beans are sticky and tend to clump during drying and the sugars in the drying pulp can attract moulds that turn the cup heavy and expressionless. (In a variant of this method, some of the pulp, but not all, may be removed by machine to reduce the risk of mould and speed up drying.) Either way, a successfully honey-processed coffee of this kind can show a lovely fruit and floral character, like fine wet-processed coffee, while also displaying hints of the deeper, rounder character associated with dry-processing. Certainly not all honey coffees successfully pull off this balancing act, but the Social Los Lajones most definitely does. It also was roasted a bit darker than most of the wet-processed coffees we cupped, pushing some of the fruit toward chocolate and deepening fresh-cut fir and related non-fruit notes. A word on nomenclature. “Honey” coffee is the latest term to describe coffee processed by this hybrid method. The method is also called “pulped natural,” a term invented by the Brazilian coffee industry, which also can take credit for refining and popularizing this method and its variants. Other terms in use for the honey process or its variants are “semi-washed” and “semi-dry.” Honey, by the way, derives from a common Latin-American term for the pulp of the coffee fruit, “miel” or honey. Aside from the Van Houtte Sumatra and the Canterbury Resiprocate Espresso Verità, we were not much impressed by the darker roasted coffees we received. In most cases, the coffee seemed to lack sufficient character to stand up to a dark roast; the slightly charred, at best vaguely dark-chocolaty, impact of the roast appeared to dominate the possibilities of the green coffees.